Endurance training: is it bad for you? To illustrate the characteristics of endurance exercise training and its positive effects on health. To provide an overview on the effects of endurance training on airway cells and bronchial reactivity. To summarise the current knowledge on respiratory health problems in elite athletes. Endurance exercise training exerts many positive effects on health, including improved metabol­ism, reduction of cardiovascular risk, and reduced all-cause and cardiovascular mortality. Intense endurance exercise causes mild epithelial injury and inflammation in the airways, but does not appear to exert detrimental effects on respiratory health or bronchial reactivity in recreational/non-elite athletes. Conversely, elite athletes of both summer and winter sports show increased susceptibility to development of asthma, possibly related to environmental exposures to allergens or poor conditioning of inspired air, so that a distinct phenotype of “sports asthma” has been proposed to characterise such athletes, who more often practise aquatic and winter sports. Overall, endurance training is good for health but may become deleterious when performed at high intensity or volume. Physical activity is increasingly recognised as a major factor of health of the general population worldwide. A sedentary lifestyle and overconsumption of processed carbohydrates and other unhealthy foods are considered major culprits of the obesity epidemics. Recent analyses showed that, despite increased knowledge about obesity and public health efforts against it, no trend inversion towards decreased body mass index (BMI) can be foreseen in the next 10 years . However, studies comparing the detrimental effects of physical inactivity and increased body weight consistently found a larger positive effect of habitual exercise compared with the effects of body weight on mortality, indicating that being fit is more protective than being lean . Among the different types of exercise training, predominantly aerobic activities appear best suited to attain favourable metabolic and cardio­vascular effects. Endurance sports are characterised by repeated isotonic contractions of large skeletal muscle groups. Classical examples include running, swimming and cycling among summer sports, and cross-country skiing or speed skating among winter sports. From a physiological point of view, endurance exercise is typically performed at submaximal intensity, with the main purpose of progressively moving the anaerobic threshold, i.e. the beginning of anaerobic metabolism and lactate production, towards higher exercise intensity. This occurs through complex modifications in muscle metabolism, with increased mitochondrial density and oxidative enzymes (i.e. the machinery necessary for energy production), shifts in fibre type, and increased capillarisation of muscle fibres. Aerobic training requires the perfect matching of the respiratory and cardiovascular systems, in order to provide the muscles with the necessary supply of energy to be transformed into mechanical work. On the part of the cardiovascular system, increased supply of arterial blood (and oxygen) to the involved skeletal muscles and constant removal of metabolic waste (such as carbon dioxide or lactate) released by the exercising muscles require an increase in cardiac output. The left ventricle undergoes hypertrophy and dilatation, and sympathetic stimulation during exercise increases myocardial contractility, contributing to the increase in stroke volume to match demand. Similar changes occur in the right ventricle. At the microvascular level, increased production of nitric oxide is associated with enhanced endo­thelium-dependent vasodilation and decreased arterial stiffness. In the elite athlete, cardiac output can increase up to 40 L⋅min−1, while in healthy subjects the response to exercise training is lower but still considerable (cardiac output from 5 up to 20 L⋅min−1). Endurance training forms the basis of ­exercise-based ­rehabilitation programmes in patients with ­cardiovascular ­disease, and exerts positive effects on autonomic balance  and ­cardiovascular outcomes [4, 5]. In contrast to the cardiovascular system, which can be “trained”, the respiratory system is oversized for the ventilation required at rest, may increase ventilation more than 20 times over baseline during exercise, but cannot improve its performance beyond its natural limits , i.e. the structural and functional properties of the lung and airways remain essentially unchanged after training. In healthy and fit individuals, hypoxaemia can develop at very high workloads. Several factors contribute to occurrence of hypoxaemia during exercise: inefficient gas exchange, vocal cord dysfunction, flow limitation in intrathoracic airways and high energy requirements by the respiratory muscles during heavy exercise [6, 7]. This latter effect could be at least partly counteracted by specific training of the respiratory muscles, which was shown to improve exercise performance in both athletes and non-athletes . The central nervous system exerts a complex and fine tuning of ventilation during exercise and is involved in the ­perception of fatigue . Adaptations in other systems also occur. For example, training increases oxygen transport through haematological adaptations such as increased red cell mass and increased plasma volume. Mobilisation of endothelial progenitors during exercise may contribute to the positive microvascular effects of endurance training . Habitual exercise is a potent factor in body weight control at all ages, and also exerts many other positive effects, including prevention of metabolic and cardiovascular disease and promotion of psychological well-being. A recent meta-­analysis including studies on the effects of running in sedentary healthy adults confirmed that BMI, body fat, resting heart rate and triglycerides decreased, while maximal oxygen uptake and high-density lipoprotein cholesterol increased, especially when regular training was prolonged over time . Similar results were reported by studies on the effects of endurance training in subjects with the metabolic syndrome . Our group has been particularly interested in studying the biological aspects of endurance exercise and training in the large airways of amateur athletes, including runners, swimmers and rowers. To study airway cells, we analysed induced sputum samples collected at rest and shortly after exercise to assess cell apoptosis and regeneration, and inflammatory markers. The interested reader is referred to a comprehensive review summarising our results . The main finding of our studies in marathon and half-marathon runners was that induced sputum showed increased neutrophil counts, especially in post-race samples, compared with induced sputum composition of healthy sedentary subjects. Interestingly, influx of inflammatory cells into the airways was not associated with any clear evidence of activation or respiratory symptoms . 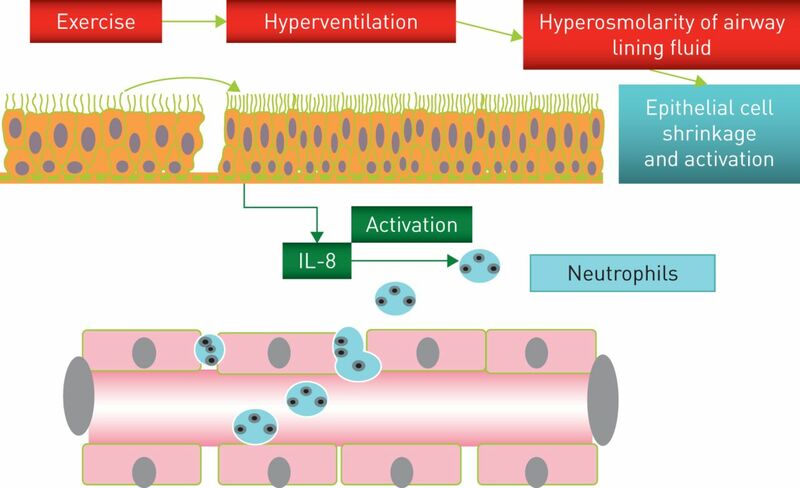 Subsequent studies showed that bronchial epithelial cells (BECs) were damaged after endurance exercise and released interleukin (IL)-8, a known chemoattractant of neutrophils (figure 1). However, this response appeared self-limiting, since a large proportion of BECs in the airways were shown to be apoptotic (figure 2) . Other studies in young competitive rowers suggested that increased BEC counts were positively associ­ated with very high ventilation rates . Environmental pollutants also appear to affect airway cell apoptosis, whereas exercise intensity seems the main factor in the pathogenesis of apoptosis of BECs . a) Bronchial epithelial cell counts in induced sputum significantly increased post-race. **: p<0.01. b) IL-8 concentration in sputum supernatants was positively correlated with bronchial epithelial cell absolute counts post-race. Oct, May and Nov refer to three different half-marathon races during which samples were collected. Reproduced from  with permission. Apoptosis of bronchial epithelial cells in post-race samples. a) Airway cell composition (Diff-Quick staining) and apoptosis (TdT-mediated dUTP nick end labelling (TUNEL)) of airway cells in induced sputum at baseline and after a half-marathon race. b) A large proportion of bronchial epithelial cells were apoptotic in post-race samples. Oct, May and Nov refer to three different half-marathon races during which samples were collected. **: p<0.01. Reproduced from  with permission. 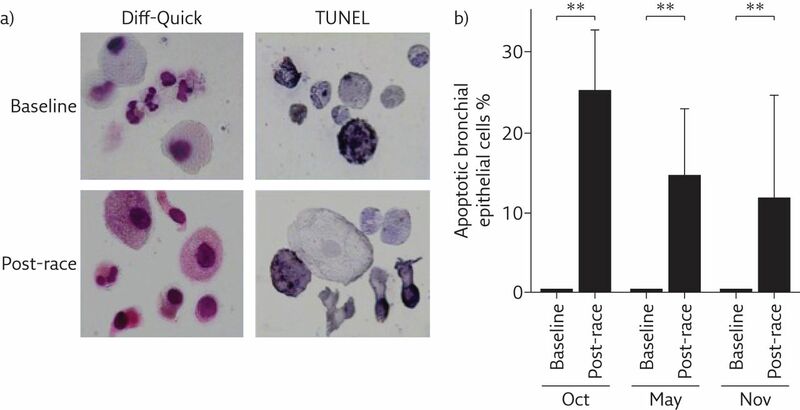 Therefore, we hypothesised that epithelial cell injury caused by insufficient conditioning of inspired air at high ventilation might be the main cause of neutrophil influx into the airways (­figure 3) . Such changes are probably of little relevance in the amateur athlete, but may cause symptoms and limit performance in elite athletes. Mechanisms responsible for epithelial injury and influx of neutrophils into the airways during endurance exercise. Reproduced and modified from  with permission. We also assessed whether airway inflammation might be associated with bronchoconstriction in non-asthmatic subjects. Acute exercise exerts a potent bronchodilator stimulation, resulting from sympathetic activation and the stretching effect of ventilation at high volumes on bronchial walls. We hypothesised that rearrangement of smooth muscle fibres in the airways could result from high ventilation volume during re­gular training. In these studies we used single methacholine (Mch) inhalation in the absence of deep inspirations, to avoid the potent bronchoprotective effect of deep inspirations that has been documented in healthy subjects . In amateur marathon runners, single Mch inhal­ation caused nonsignificant changes compared with those observed in sedentary healthy subjects . Moreover, an intensive training ­programme of rowing for 12 weeks decreased the response to single Mch inhalation in the absence of deep inspirations in previously sedentary normal subjects  and patients with mild asthma . An inverse relationship between the degree of bronchial reactivity and the amount of physical activity has also been reported in the general population , in agreement with our results. Finally, studies in models of atopic asthma [24, 25] and patients with asthma [26, 27] under­going endurance training confirm the favourable effects of training on the pathological and clinical characteristics of asthma. In summary, in our non-elite amateur athletes living in a moderate climate region and with no respiratory complaints associated with exercise, we found no evidence for detrimental effects of endurance exercise on respiratory health. Indeed, habitual endurance exercise seems to reduce bronchial reactivity in healthy subjects and possibly asthmatic patients, although more data are necessary to identify the intensity threshold ­necessary for protective effects of endurance exercise to be fully displayed. This is especially relevant for setting training programmes in patients. Data obtained in elite endurance athletes are different from those obtained in subjects with low to moderate training volumes. Several reports underline that respiratory symptoms are common in elite endurance athletes, especially of aquatic and winter sports. Asthma treatment is often needed to prevent performance limitation in elite athletes, raising concerns about use of potentially doping substances. Exercise may induce bronchoconstriction (exercise-induced bronchoconstriction (EIB)) and respira­tory symptoms. Both airway dehydration and cooling are considered important in the pathogenesis of EIB . In vitro experiments showed release of IL-8 by cultured BECs exposed to hyperosmolarity or low temperature . However, studies on athletes found a loose association of respiratory symptoms with documented EIB . A study in athletes participating in summer or winter Olympic games between 2002 and 2008 reported an 8% prevalence of asthma/airway hyperresponsiveness (AHR) in this highly selected population, with the highest rates recorded in cross-country skiers (17.2%) and triathlon athletes (24.9%). Performance was apparently not affected, since a large proportion of asthmatic athletes won medals . Nevertheless, it is possible that elite athletes have an increased risk of developing airway injury due to their high training volume . Accordingly, some authors suggest that airway dysfunction in elite athletes should be classified as an occupational lung disease, since longitudinal studies showed worsening airway function with persistent training over the years and improvement in athletes who interrupted their competitive career . In more detail, in athletes with “ski asthma”, pathological changes were found in the airways . A high variability in the airway responsiveness to direct and indirect stimuli was found , and inhaled corticosteroids were not effective in improving inflammation or airway hyperreactivity . Elite athletes of endurance aquatic sports also show a high prevalence of asthma . The airway pathology shows major similarities between swimmers and asthmatics, with increased production of mucin only found in swimmers . AHR to Mch is also highly prevalent in swimmers, but decreases after interruption of training for 2 weeks . In swimmers, the high concentration of chlorine derivatives in the environment of the swimming pools is a potential risk factor for respiratory problems, and this has raised public health concern for noncompetitive swimmers and children attending public pools . This topic is still under debate , after a longitudinal study by Font-Ribera et al. reported a protective effect of swimming against the development of asthma or airway hyperreactivity in young children. What is the pathophysiology of sports asthma? The pathophysiology of asthma in athletes remains elusive. Predisposition to atopic diseases is frequent in the general population, and some athletes are atopic and prone to develop asthma irrespective of frequency and intensity of physical activity. Sports asthma in nonatopic athletes is probably due to a different mechanism. Indeed, latent class analysis was recently applied to respiratory symptoms and function in Olympic summer and winter sports, and in aquatic versus nonaquatic sports, and a clear difference emerged between two athlete phenotypes . The cluster “atopic asthma” was characterised by allergic sensitisation, rhinitis and allergic comorbidities, and increased exhaled nitric oxide levels, while the cluster “sports asthma” was characterised by exercise-induced respiratory symptoms and AHR without allergic features . This distinction opens the way to a more precise phenotypic assessment of respiratory problems in athletes, and possibly to more effective clinical management. A recent study points to the involvement of the parasympathetic system in the pathogenesis of EIB in athletes . In winter sports athletes, the degree of bronchoconstriction observed in response to a Mch challenge correlated with the bronchodilator response to ipratropium bromide, suggesting that increased parasympathetic tone in endurance athletes can adversely affect airway tone . The lack of correlation between the response to Mch and the bronchodilator effect of salbutamol is in agreement with the clinical observation that athletes with respiratory problems show a modest response to inhaled β-agonists. This study opens the way to a new paradigm for the evaluation of respiratory symptoms and function in athletes, but whether similar changes occur also in summer and aquatic sports athletes is still unknown. Is endurance exercise good for you? In 2010 the World Health Organization (WHO) issued guidelines for physical activity . In adults aged 18–64 years, aerobic physical activity should be performed throughout the week for ≥150 min (moderate intensity) or for 75 min (vigorous intensity), or an equivalent combination of moderate- and vigorous-intensity activity. Bouts of aerobic activity should last ≥10 min each. For additional health benefits, adults should aim at doubling the suggested amount of moderate or vigorous physical activity . These guidelines have been adopted in the USA and in other countries worldwide. More recently, a large epidemiological study conducted in >55 000 subjects followed for 15 years found that running exerted protective effects against all-cause and cardiovascular mortality even at lower amount/frequency/intensity than recommended by the WHO (figure 4) . 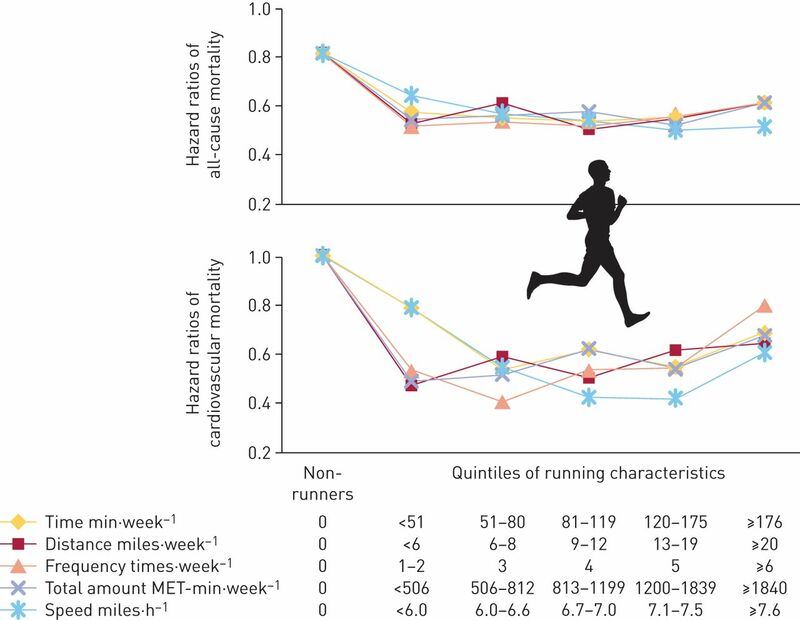 Interestingly, an advantage for health was seen at the first quintile of running time per week (<51 min) compared with non-runners, with further small increases in the second to fourth quintiles. The fifth quintile (≥176 min⋅week−1) showed a relative increase in risk, suggesting that overtraining might, in the long run, exert deleterious effects. All-cause and cardiovascular mortality according to running quintiles. MET: metabolic equivalent. Reproduced from  with permission. Therefore, there is little question that regular aerobic exercise is good for health, even when performed at a low intensity or frequency. Asthmatic subjects should not avoid physical exercise, since evidence is accumulating for better disease control after aerobic training. Too much aerobic exercise may be detrimental in the general popu­lation, and even more risky in the elite athlete population, which shows a significant respiratory impairment associated with intense exercise. Respiratory function in elite athletes might return to normal after interruption of competitive activity, but this topic needs further study. Which of the following effects of endurance training is/are correct? c) Reduction of all-cause and cardiovascular mortality. Which of the following statements concerning endurance training is/are correct? a) Mitochondrial density in muscle fibres does not change. b) The anaerobic threshold increases. c) The heart undergoes hypertrophy and dilatation. d) High-density lipoprotein cholesterol decreases. Which of the following statements is/are true concerning the effects of training on airway cells and bronchial reactivity? a) Induced sputum in runners showed low bronchial epithelial cell counts in post-race samples. b) Induced sputum in runners showed increased neutrophil counts, especially in post-race samples. c) There is no correlation between bronchial reactivity and the amount of physical activity in the general population. d) Regular endurance exercise in asthmatic patients improves asthma control. Which of the following statements is/are true concerning the elite athlete? a) Respiratory symptoms are common in athletes of aquatic and winter sports. b) Elite athletes develop respiratory symptoms in association with documented EIB. c) Asthma treatment is often needed to prevent performance limitation in elite athletes. d) Asthmatic athletes rarely win Olympic medals. NCD Risk Factor Collaboration (NCD-RisC). Trends in adult body-mass index in 200 countries from 1975 to 2014: a pooled analysis of 1698 population-based measurement studies with 19.2 million participants. Lancet 2016; 387: 1377–1396. Physical activity and all-cause mortality across levels of overall and abdominal adiposity in European men and women: the European Prospective Investigation into Cancer and Nutrition Study (EPIC). Am J Clin Nutr 2015; 101: 613–621.
. Exercise protects the cardiovascular system: effects beyond traditional risk factors. J Physiol 2009; 587: 5551–5558. Exercise and the cardiovascular system: clinical science and cardiovascular outcomes. Circ Res 2015; 117: 207–219. Leisure-time running reduces all-cause and cardiovascular mortality risk. J Am Coll Cardiol 2014; 64: 472–481.
. Respiratory physiology: adaptations to high-level exercise. Br J Sports Med 2012; 46: 381–384. Update in the understanding of respiratory limitations to exercise performance in fit, active adults. Chest 2008; 134: 613–622. Respiratory muscle endurance after training in athletes and non-athletes: a systematic review and meta-analysis. Phys Ther Sport 2016; 17: 76–86.
. Pathophysiology of human ventilatory control. Eur Respir J 2014; 44: 495–512. Hemopoietic and angiogenetic progenitors in healthy athletes: different responses to endurance and maximal exercise. J Appl Physiol 2010; 109: 60–67. van Mechelen W, et al. Meta-analyses of the effects of habitual running on indices of health in physically inactive adults. Sports Med 2015; 45: 1455–1468. The effect of exercise on the cardiovascular risk factors constituting the metabolic syndrome: a meta-analysis of controlled trials. Sports Med 2013; 43: 121–133. Effects of exercise on the airways. In: Zaslav KR, ed. An International Perspective on Topics in Sports Medicine and Sports Injury. Rijeka, InTech, 2012; pp. 187–212. Airway inflammation in nonasthmatic amateur runners. Am J Physiol Lung Cell Mol Physiol 2001; 281: L668–L676. Bronchial epithelial damage after a half- marathon race in nonasthmatic amateur runners. Am J Physiol Lung Cell Mol Physiol 2010; 298: L857–L862. Airway cell composition at rest and after an all-out test in competitive rowers. Med Sci Sports Exerc 2004; 36: 1723–1729. Environmental conditions, air pollutants, and airway cells in runners: a longitudinal field study. J Sports Sci 2009; 27: 925–935. Increased airway inflammatory cells in endurance athletes: what do they mean? Clin Exp Allergy 2003; 33: 14–21. Potent broncho­protective effect of deep inspiration and its absence in asthma. J Appl Physiol 2000; 89: 711–720. Reduced airway responsiveness in nonelite runners. Med Sci Sports Exerc 2005; 37: 2019–2025. Effects of exercise training on airway responsiveness and airway cells in healthy subjects. J Appl Physiol 2010; 109: 288–294. Effects of exercise training on airway closure in asthmatics. J Appl Physiol 2012; 113: 714–718. Physical activity and bronchial hyperresponsiveness: European Community Respiratory Health Survey II. Thorax 2007; 62: 403–410. Aerobic exercise attenuates airway inflammatory responses in a mouse model of atopic asthma. J Immunol 2004; 172: 4520–4526. Airway epithelium mediates the anti-inflammatory effects of exercise on asthma. Respir Physiol Neurobiol 2011; 175: 383–389. Effects of exercise training on airway hyperreactivity in asthma: a systematic review and meta-analysis. Sports Med 2013; 43: 1157–1170. de Carvalho-Pinto RM, et al. Aerobic training decreases bronchial hyperresponsiveness and systemic inflammation in patients with moderate or severe asthma: a randomised controlled trial. Thorax 2015; 70: 732–739.
. The mechanism of exercise-induced asthma is... J Allergy Clin Immunol 2000; 106: 453–459. Hyper­osmolarity-induced interleukin-8 expression in human bronchial epithelial cells through p38 mitogen-activated protein kinase. Am J Respir Crit Care Med 1999; 159: 634–640. Self-reported symptoms and exercise-induced asthma in the elite athlete. Med Sci Sports Exerc 2001; 33: 208–213.
. An overview of asthma and airway hyper-responsiveness in Olympic athletes. Br J Sports Med 2012; 46: 413–416. Respiratory health of elite athletes – preventing airway injury: a critical review. Br J Sports Med 2012; 46: 471–476. Airway dysfunction in elite athletes – an occupational lung disease? Allergy 2013; 68: 1343–1352. Evidence of airway inflammation and remodeling in ski athletes with and without bronchial hyperresponsiveness to methacholine. Am J Respir Crit Care Med 2000; 161: 2086–2091. Airway hyperresponsiveness to methacholine, adenosine 5-monophosphate, mannitol, eucapnic voluntary hyperpnoea and field exercise challenge in elite cross-country skiers. Br J Sports Med 2010; 44: 827–832. Placebo-controlled study of inhaled budesonide on indices of airway inflammation in bronchoalveolar lavage fluid and bronchial biopsies in cross-country skiers. Respiration 2000; 67: 417–425. Prevalence and characteristics of asthma in the aquatic disciplines. J Allergy Clin Immunol 2015; 136: 588–594. Airway remodeling and inflammation in competitive swimmers training in indoor chlorinated swimming pools. J Allergy Clin Immunol 2012; 129: 351–358.
. Airway hyperresponsiveness in elite swimmers: is it a transient phenomenon? J Allergy Clin Immunol 2011; 127: 892–898.
. Con. Respiratory risks associated with chlorinated swimming pools: a complex pattern of exposure and effects. Am J Respir Crit Care Med 2011; 183: 570–573.
. Pro. Swimming in chlorinated pools and risk of asthma: we can now carry on sending our children to swimming pools! Am J Respir Crit Care Med 2011; 183: 569–570. Swimming pool attendance, asthma, allergies, and lung function in the Avon Longitudinal Study of Parents and Children cohort. Am J Respir Crit Care Med 2011; 183: 582–588. Two distinct pheno­types of asthma in elite athletes identified by latent class analysis. J Asthma 2015; 52: 897–904. Increased ­bronchial parasympathetic tone in elite cross-­country and biathlon skiers: a randomised crossover study. Br J Sports Med 2014; in press [DOI: 10.1136/bjsports-2014-094053]. You are going to email the following Endurance training: is it bad for you?